It’s Clobberin’ Time | The Fantastic Flame On! 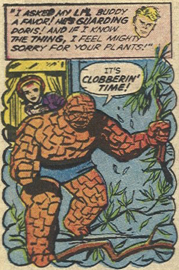 Is this the most underwhelming use of the phrase ‘It’s Clobberin’ Time’ ever seen in the pages of the Fantastic Four? 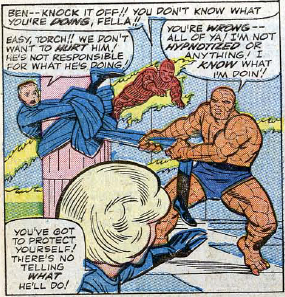 It’s got to be one of the (dare I say it) laziest panels it’s ever been used on, with Ben and his combatant drawn in the roughest strokes. Even John Byrne, with his infamous ‘Snowblind’ issue of Alpha Flight, would have balked at this. 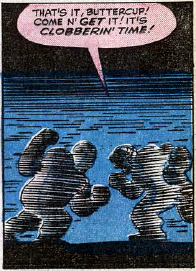 As much as I hate to say that a Kirby panel was rushed, lazy, or poorly done, the fact that if you take away the speech balloon you can’t tell which blurry blob is the Thing speaks volumes. Unfortunately for everyone involved, the first blurry blob turns out to be one of the Red Ghost’s stupid apes. Oh, happy happy joy joy. It’s quite clear at this point that neither Stan nor Jack are treating ‘It’s Clobbering Time’ as a proper catchphrase for The Thing. The phrase has clearly stuck with Stan from the previous issue of Strange Tales, but it has yet to embed itself into the strip in the same way that ‘Flame On’ has. Which is why the second use of it comes on the page’s smallest panel, snuck in between an overly-explanatory caption box and a minuscule drawing of Ben breaking free of Iceman’s ice. A historic moment in the history of the Fantastic Four. So historic that we completely forgot to mention it on the podcast. Well, to be fair, when looking for the first time The Thing utters his iconic catchphrase, ‘It’s Clobberin’ Time’, you’d hardly expect to have to be looking at an issue of Strange Tales featuring the Plant Man. It’s an inauspicious start for the catchphrase. Ayers’ small panel and scratchy definition on the Thing makes it look like he’s daintily stepping around the plants, rather than wantonly destroying them to save Dorrie Evans. In the context of this panel alone, it seems like Stan popped in a pithy, macho-sounding phrase simply to meet his own rule of ensuring that each character in a panel receives something to day. Except Dorrie, of course. Which is good.